Avviso! Notice! 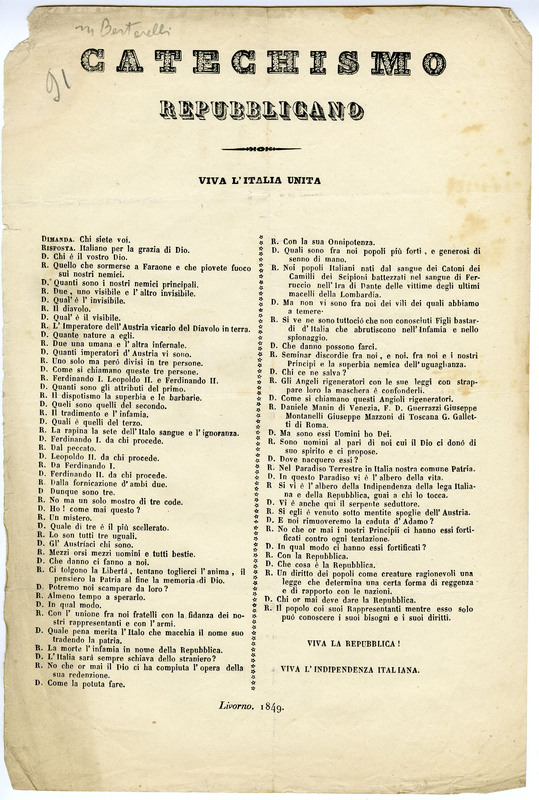 Italian Risorgimento Broadside Collection now accessible! Despite the fact that the history of the Italian peninsula is so rich and so well known, many people forget that Italy is a very young country—even younger than the United States. In fact, the Italy that we know today did not become unified until 1861 and Rome did not become her capital until 1871. The vast Italian Risorgimento collection held in Archives and Special Collections contains three parts—books, pamphlets, and broadsides—and allows us to better understand the Italian revolutionary period that led up to Unification. I had the privilege of working on the broadside collection, nearly 6000 documents that would have been hung in public spaces to convey important information to people living in a given city or town. The collection is in fantastic condition, and it appears that most of these particular broadsides were not actually hung, but were collected and catalogued by various people in the different regions in which they were produced. Documents in such good condition are rare, and allow us to not only see the progression of historical events, but also the innovations in printing that occurred over the course of the 18th and 19th centuries. The earliest documents in the collection are printed on thick paper, often with a more ornate typeface and with intricate regional mastheads. Over the course of 200 years, the paper quality declines and typefaces become more standardized. While there are still ornate mastheads, they are not nearly as intricate as earlier examples. One of the most interesting things about looking at the documents as whole – which are now accessible to the public and in chronological order— is that one can see the evolution of the various issues that they discuss. One day, there might be a document warning about a potential epidemic (often cholera or bovine influenza) and a few days later there may be another instructing people on how to sterilize their homes and barns in order to prevent further infection. Many of the documents also speak to the dramatic political changes that occurred in the Peninsula. There are a significant number of broadsides from the Napoleonic period, when Napoleon and his forces were in control of Northern Italy. Napoleon created the Cisalpine Republic, and there are many documents from this provisional government. What is most interesting about these broadsides though, is that they use the newly created French Republican calendar, which had an entirely different month/day scheme from the traditional Gregorian system. 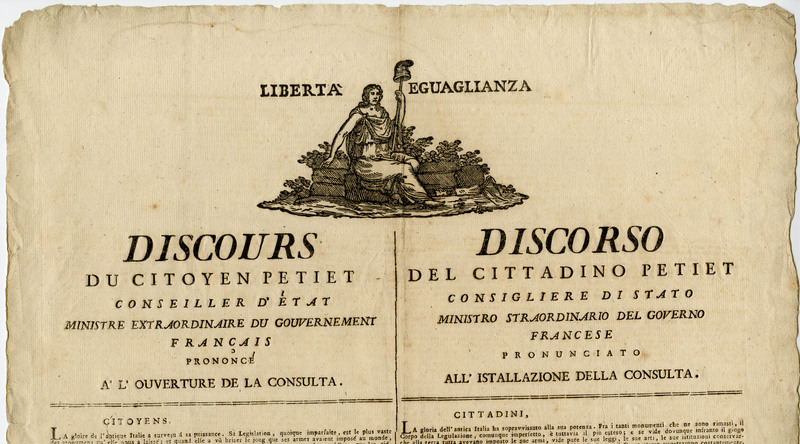 While this makes dating the broadsides a bit more difficult, is also shows us the influence of the French Revolution on Italy and how interconnected the two nations were during the 19th century. 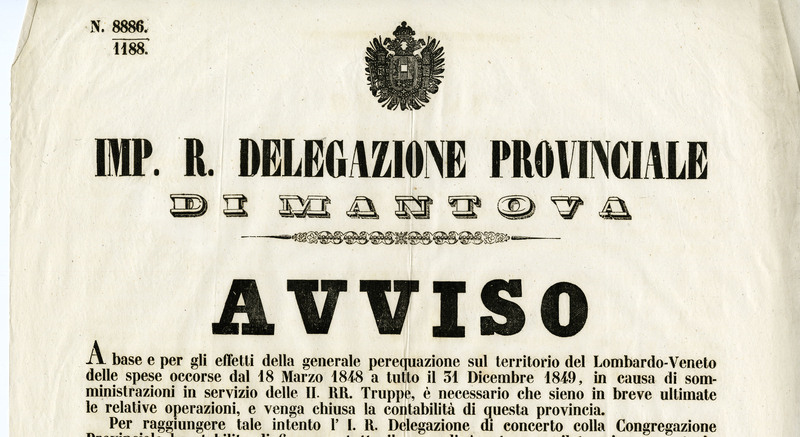 As the collection is focused on the Risorgimento, which means Resurgence in Italian, it is fitting that the largest number of documents come from major revolutionary years 1831, 1848, and 1849. While there are so many interesting documents to see, two that I found particularly fascinating came from 1849. The first is a proclamation from the Roman Republic, which lasted for only 6 months, declaring freedom on religion. This was a major development, not only because of Italy’s Catholic legacy, but because it was coming from Rome, the seat of the Pope. Keeping with this theme of religion, I also discovered a Republican Catechism. This document is structured in the question/answer format of a traditional catechism, but discusses revolutionary goals, enemies, and allies. It is a perfect example of the marriage between tradition and innovation in the newly developing Italian state. This is just a sampling of the rich materials to be found in the Italian Risorgimento Broadside collection, which will prove to be an invaluable historical resource.